This species is accepted, and its native range is S. Ethiopia to N. Kenya. Tufted succulent perennial with a thick fleshy root and main stem to 5 cm. high and 2 cm. in diameter, the apex just above ground-level; branches produced successively from the apical growing-point, erect then spreading, to 15 cm. long, usually shorter, 1 cm. thick, cylindrical, seldom rebranched, dark green with lighter longitudinal stripes and shallow teeth to 1.5 cm. apart in 5 longitudinal series. Spinescence greyish brown; spine-shields longitudinal, to 9 × 1.5 mm., decurrent to 8 mm. 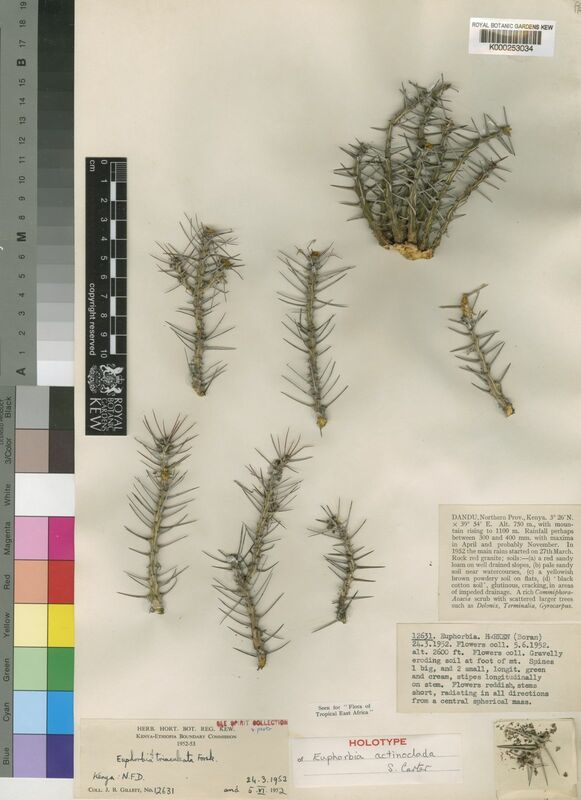 ; spines single to 2 cm. long; prickles to 2.5 mm. long. Leaves deltoid, 1 × 1 mm. Cymes solitary, 1-forked, with peduncle and cyme-branches 1 mm. long; bracts oblong, ± 1.75 × 1 mm. Cyathia ± 2 × 4 mm., with funnel-shaped involucres; glands transversely rectangular, ± 1 × 1.75 mm., contiguous, reddish; lobes subcircular, ± 1.25 mm. in diameter, deeply toothed. Male flowers:bracteoles few, fan-shaped, deeply dentate; stamens 3.5 mm. long. Female flower:ovary shortly pedicellate; styles 1.75 mm. long, joined at the base, with thickened rugose apices. Male flowers:bracteoles few, fan-shaped, deeply dentate; stamens 3.5 mm. long. Female flower:ovary shortly pedicellate; styles 1.75 mm. long, joined at the base, with thickened rugose apices. Capsule and seeds not seen. Gravelly slopes with sparse deciduous bushland; 650–900 m.
S. Carter in Hook., Ic. Pl. 39, t. 3851 (1982).